Netflix has renewed Lemony Snicket’s A Series of Unfortunate Events for a third and final season, according to a report by Deadline. This news comes less than a month after the announcement that the show was renewed for a second season. The first season, which consisted of eight episodes, aired earlier this year. A Series of Unfortunate Events is based on the thirteen-book series of the same name. It chronicles the travails of the three Baudelaire orphans, as they survive one catastrophe after another and try to stay one step ahead of the nefarious Count Olaf. The first season is an adaptation of the first four books in the series: The Bad Beginning, The Reptile Room, The Wide Window, and The Miserable Mill. The third season will presumably cover the last four books in the series, including the series conclusion, aptly titled The End. 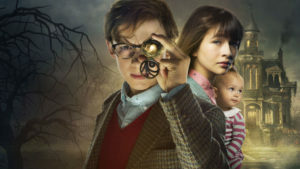 The show stars Malina Weissman as Violet Baudelaire, Louis Hynes as Klaus Baudelaire, Presley Smith as Sunny Baudelaire, Neil Patrick Harris as Count Olaf, and Patrick Warburton as Lemony Snicket. The series is created by Lemony Snicket author Daniel Handler and executive produced by Handler and Emmy winner Barry Sonnenfeld. The series also features K. Todd Freeman (Mr. Poe), Joan Cusack (Justice Strauss), Alfre Woodard (Aunt Josephine), Catherine O’Hara (Dr. Orwell), Aasif Mandvi (Uncle Monty), Don Johnson (Sir) and more. Read our reviews of the first season HERE.